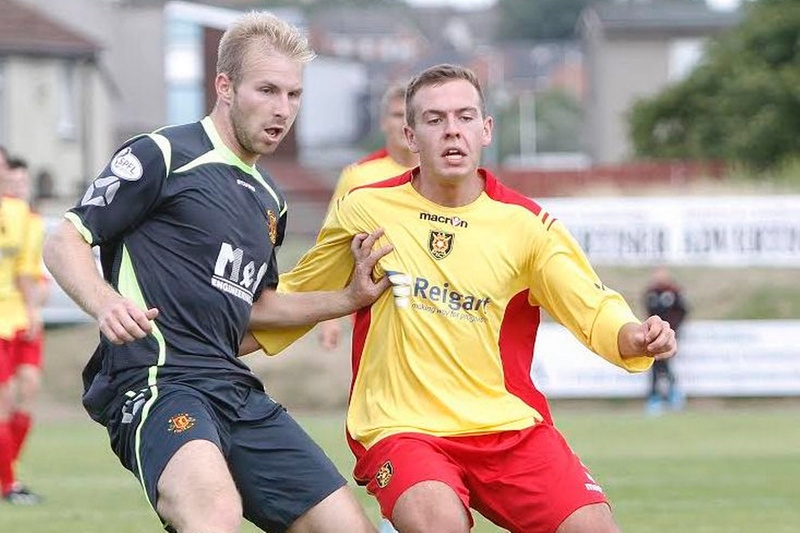 Annan Athletic’s second half of the season kicked off at Coatbridge exactly like the opening game of the season with Annan suffering a second defeat against title challengers Albion Rovers. The Annan boss who is currently plagued by injury worries suffered more call offs with his already depleted squad facing more misery with Peter Weatherson and Matty Flynn both failing to make the line up however the Annan boss welcomed the return of keeper Alex Mitchell and midfielder Steven Logan. Albion started promisingly taking the game to Annan but without posing any real threat , Mitchell dealt with McGuigan’s 4th minute effort and Scott Chaplain blasted over the bar in the 9th and 11th minutes. Annan’s first real attempt on goal arrived in the 17th minute when Josh Todd ended a promising move with a shot which failed to hit the target. Annan created a good opportunity in the 24th minute when Stuart McColm collected a Ryan McStay free kick and it took an important save from Neil Parry to divert the ball round the post. The diminutive Marc McKenzie carried the most threat for Albion and his 30th minute effort was easily dealt with by Alex Mitchell. Scott Davidson making a return to the starting line up forced a corner for Annan in the 33rd minute. Annan had a scare in the 35th minute when Mitchell’s misplaced kick out presented McKenzie with an opportunity but Mitchell recovered well to deal with his effort. David Hopkirk almost broke the deadlock in the 37th minute when his well struck shot from the edge of the box flashed past the upright. With the game edging towards half time the Annan defence were exposed when a long clearance fell invitingly for Marc McKenzie who suddenly found himself clean through on goal only to be denied by a superb Mitchell save. It was a real let off for Annan in a first half which lacked any real quality from either team. The defining moment in the game arrived in the 51st minute and it was an error by Martin McNiff which presented the opportunity to McKenzie, when McNiff failed to control the ball and all of a sudden McKenzie was clean through on goal finishing with a low shot drilled into the corner of the net past Alex Mitchell. Mitchell tipped over Mark McGuigan’s well struck shot in the 61st minute and minutes later a poor Keiran Brannan clearance presented Scott Chaplain with an opportunity but he drilled the effort into the side netting. Neil Parry then pulled off a good save to deny Keiran Brannon. Annan pushed forward in an effort to try and salvage something from the game but they could not break down the well organised Albion defence and although Annan had plenty of the ball they failed to create any real openings. Albion eventually sealed the game in injury time after Annan won a corner and with everyone up including keeper Alex Mitchell , Albion cleared the danger and broke immediately to the other end with John Gemmel picking out Josh Mullin who made no mistake from 12 yards. It was an important victory for Albion which keeps them well in touch with Arbroath at the top of the table . Annan boss Jim Chapman will no doubt be looking to bolster his depleted squad in the transfer window in an effort to try and revitilise their push for one of the play off places. ALBION ROVERS :Neil Parry, Alan Reid, Josh Mullin, Ross Davidson, Ross Dunlop, Michael Dunlop, Marc McKenzie ( John Gemmell 81min) , Scott Chaplain (Ally Love 69min), Mark McGuigan, Gary Fisher, Gary Phillips. SUBS NOT USED: Ciaran Donnelly, Kyle Turnbull, Kieran Hughes, TJ McCluskey, Chris Dallas.